We have adults and we have teenagers. There are no G4 characters, remember? I'm also looking for good G3 content of young people and kids and G4 faces. I need both good quality teenagers and pre-teen children. I've looked at the Royal Family pack, but the kids in this are slightly older than what I'm looking for. And it's a bit pricey considering I don't need most of the content in there. Some of the pre-existing teen and kids stuff is lower grade and when you mix these characters with the G4 real male and female faces, they look a bit out of place. I really need this content as soon as possible, so if anyone out there is about to publish anything they would be gratefully received. Hi there, Bigboss and I are working together on kids packages. I was not going to post this yet but - what the heck. Please note that we are taking our time on this, because we do want to do our very best in these packs and we want them to stand out. I've learned a lot over the last while in texturing and every character takes me a few days and a lot of trial and error til I get it right. And Bigboss can make high quality accessories to compliment the packs with his skill in 3ds Max. So, here is an early picture of what we are working on. If you have something specific you want, please let us know. You talk about ages.....what age are you looking for. I estimate these boys could be anywhere from 9 to 12. Are you looking for 5 year olds? Say the word and we will give it a shot. Also, what sort of clothes are you looking for - present day? Any more info would be great and we will see what we can do. You may want to look HERE also Marc. Have a look round the store, there is loads of content for both G2 and G3 Clone Cloths, you may find something that suits your needs.....all the packs are reasonably priced. Hope this may be of somehelp, if not now, then in the future. Those are looking pretty awesome there, Alley and BB! Shygirl: Thanks, i saw those before, but they're a bit younger than I was looking for. Alley: Nice work, I'll certainly be considering buying these from the content store as they're a good age for some of the characters. The clothes are not what I'm after, but that's not an issue because I'll be making my own since I'm wanting fantasy-style clothes with a specific look. On you're question of age. I need teenagers of around 16-17. This is really are very important to me because they will be the main characters in my movie. I can certainly use kids of 9-12 age too, so will certainly be buyinfg your packs. I'm also looking for children of school-starting age so yes, around 5 years old is what I'm looking for. The Toddler packs as described by Shygirl is just to young. 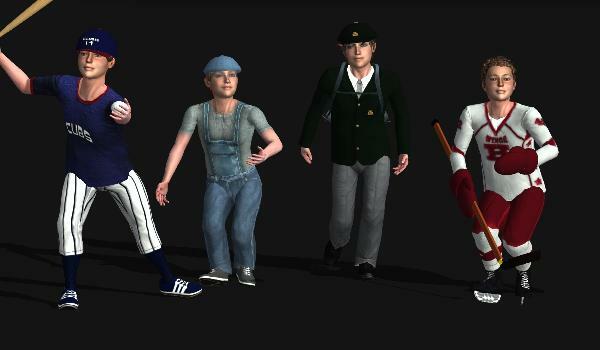 In all, I'm making quite a long movie and suspect that I will need characters of all age ranges. I also need a baby for my movie. I can have a look around the store for anythig that already exists. But I'm very interested in new G3 characters with real G4 faces. Anything you can help with will gratefully be received. 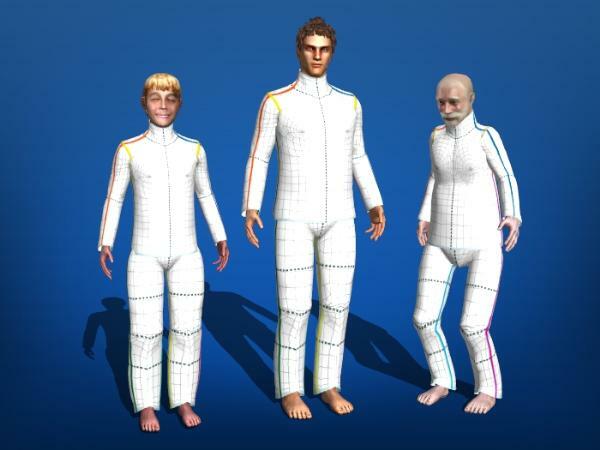 As well as the great content already mentioned above, there should be a CloneCloth for Kids/Teenagers appearing later in the year. More news to come on this pack. The basic personality of iClone characters is in the face. Start with a youngster face. You will get a young fellow!. Bodies, in iClone are abstract in the sense they do NOT have a definite proportion. The tools for shaping the body, available at the Modifier Panel, allow for drastic changes in the body proportions. Usually, the younger the person, the bigger the head is compared to the rest of the body. Bellow, an image I made using standard CloneClot 3 Trey. Just changed the heads and body proportions! I see no mystery on this!. Of course today, kids use almost the same style clothing as adults, so finding clothing is not a problem either.